Aurora Aksnes (born 15 June 1996), known mononymously as Aurora (stylised as AURORA), is a Norwegian singer-songwriter and producer. Her debut EP Running with the Wolves was released through Decca Records in May 2015, receiving widespread approval from online music blogs and national press. Later the same year she provided the backing track for the John Lewis Christmas advert, singing a cover of the Oasis song "Half the World Away". This cover appears as a bonus track on the deluxe version of her debut studio album, All My Demons Greeting Me as a Friend, which was released worldwide on 11 March 2016. Aurora performing in 2018 at Stavernfestivalen in Norway. Her music is characterized by a dreamy, emotional and sophisticated pop, but still very catchy and direct; in the instrumental sections there are electronic, orchestral and folk elements. She has sometimes been compared to Susanne Sundfør, Emilíana Torrini, Florence and the Machine, Eivør, Kate Bush, Lana Del Rey, Lorde and Björk. Aurora Aksnes was born on 15 June 1996 in Stavanger, Norway. She has two older sisters. She grew up in Os, a municipality in Hordaland close to Bergen. She began creating melodies at the age of 6, and began writing lyrics at the age of 9. Songs such as "Running With the Wolves", "I Went Too Far" and "Runaway" were written in this early stage of her life, "Runaway" being written when she was 12. Aurora has mentioned she has been in relationships with men and women. Aurora Aksnes at Green Man Festival 2015. Aurora's first track "Puppet" was released in December 2012, followed by her second, "Awakening" in May 2013. Her first single signed to her labels Glassnote Records and Decca Records, "Under Stars" was released in November 2014, and "Runaway" followed in February 2015. "Runaway" achieved success in the UK on streaming service Spotify, reaching 1 million streams after just 6 weeks. The track was also received positively by various online music blogs and national press such as the NME. Her second single, "Running with the Wolves" was released in April 2015 and received attention from national BBC stations Radio One, Radio Two and 6Music. The excitement surrounding the young songstress propelled her onto the festival circuit and she appeared at renowned summer festivals such as Way Out West, Wilderness and Green Man Festival. Aurora's third single, "Murder Song (5, 4, 3, 2, 1)" was released in September 2015 and has received continued support in national press, on national radio and popular online music blogs. Aurora performed at the prestigious 2015 Nobel Peace Price Concert. She has played a sold out headline show in London and supported Of Monsters and Men at Brixton Academy in November 2015. Aurora recorded a cover of the Oasis track "Half the World Away" for the 2015 John Lewis Christmas advert. Her next single, which came after "Half The World Away", was released in January 2016, titled "Conqueror" and a music video was uploaded the following month. Her debut album All My Demons Greeting Me as a Friend was eventually released on 11 March 2016, receiving generally positive reviews from critics. After releasing it, she went on to embark on her European tour, making a number of visits to the UK in between. She featured in British band Icarus' song "Home" and released a cover of David Bowie's Life on Mars. On 14 March 2016, Aurora made her American television debut on The Tonight Show Starring Jimmy Fallon, performing "Conqueror". Aurora soon after performed the track on Conan. On 25 July 2016 she performed her cover of "Life on Mars" on The Howard Stern Show. The following night on 26 July, she performed "I Went Too Far" on The Late Show with Stephen Colbert. On the day of releasing her debut All My Demons Greeting Me as a Friend, Aurora said that it was "the first album of many" that she has planned. As of 12 May 2016, after coming back from her European tour, the singer announced that was ready to begin writing and producing more material, which will eventually form her second studio album. She has said in a Facebook event that she has 15 demo songs and has written 1,000 songs/poems. Since the announcement, Aurora has released "I Went Too Far" as a single, and a music video for the track was released on 4 July 2016. According to Aurora, her second album was expected to be released in the fourth quarter of 2018. Between April and August 2018, the singer released two singles, "Queendom" and "Forgotten Love", which would be included in the first half of a two-part album divided into "steps". Aksnes recorded the album during her stay in France in January of that year, and the production included the producers Askjell Solstrand, Roy Kerr and Tim Bran, with Aksnes herself also involved in this aspect. Some of that new material was anticipated in live performances, including festivals like Lollapalooza and Coachella. While maintaining some of the themes and stories of the previous album, this production would mark the first time that Aksnes makes inclusion of political and sexuality themes in her songs. Most of the new inspiration for those came from the interaction that she had with her fans during her first musical tour. The music video for "Queendom" saw its release in May 2018, and it included a message to her LGBT fans; such message was portrayed by Aksnes herself kissing one of her female dancers, during what was described as a "big kissing party" that shows that "every type of love is accepted and embraced" in the singer's "queendom". On September 28, 2018, the singer surprisingly released the first half of her second album on EP format, under the title Infections of a Different Kind (Step 1), while "step 2" would follow either 2019 or 2020. 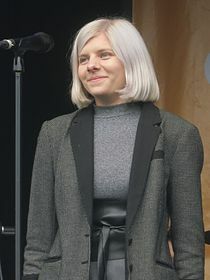 The EP features eight songs, and the title itself comes from the eighth track included on it, which Aurora declared as "the most important song I've ever written". Shortly after the release, the singer and her band went on a musical tour that started in Manchester, UK, headlined by Cub Sport. On 12 April 2019, Aurora made a songwriting appearance with The Chemical Brothers on their ninth album No Geography, contributing to the songs, "Eve of Destruction", "Bango" and "The Universe Sent Me". Aurora mentioned Enya, Bob Dylan, Underworld_(band) and Leonard Cohen as her influences. ^ "Aurora Aksnes". Brak. Retrieved 15 May 2016. ^ Kaplan, Ilana. "Listen to Teenage Songstress AURORA's Deft Debut EP". Noisey Vice. Retrieved 10 August 2015. ^ "Aurora Announces Debut EP Titled Running with the Wolves". Pastemagazine.com. Retrieved 17 April 2018. ^ "Saman mot toppen". Magasinett.no. Retrieved 27 June 2016. ^ O'Flynn, Brian (2018-09-13). "Aurora interview: 'None of my songs are about me'". The Independent. Retrieved 2018-09-16. ^ "AURORA - Awakening". SoundCloud. ^ "Running With The Wolves". BBC Music. ^ "Way Out West » AURORA". Way Out West. Archived from the original on 25 September 2015. ^ "Aurora - Wilderness". wildernessfestival.com. Archived from the original on 25 September 2015. ^ "Aurora". Green Man Festival. Archived from the original on 25 September 2015. ^ Butler, Will. "Check out chilling 'Murder Song' from Norwegian singer, Aurora". gigwise.com. ^ "Aurora - Murder Song". Murder Song. ^ "Of Monsters & Men hit the road with Highasakite & Aurora!". 24 November 2015. Retrieved 27 June 2016. ^ NME.COM. "Norwegian singer Aurora covers Oasis' 'Half The World Away' for John Lewis Christmas advert – watch". NME.COM. ^ "AURORA announces debut album, All My Demons Greeting Me As A Friend". Thefourohfive.com. Retrieved 17 April 2018. ^ "Aurora guests on The Tonight Show starring Jimmy Fallon". NBC. Retrieved 26 March 2016. ^ "Interview AURORA par Aurora France - #AskAuroraFR". YouTube. Aurora France. Retrieved 9 March 2018. ^ "Queendom - Single by AURORA". iTunes Apple. Retrieved September 6, 2018. ^ "Forgotten Love - Single by AURORA". iTunes Apple. Retrieved September 6, 2018. ^ "Aurora interview: I want to fight for everything that can't fight for itself". Standard.co.uk. May 4, 2018. Retrieved September 6, 2018. ^ "AURORA advances its album with 'Queendom', which seeks "a place for all of us"". Jenesaispop (in Spanish). April 17, 2018. Retrieved September 6, 2018. ^ "Aurora fez um show místico e cheio de amor no Lollapalooza 2018". Capricho (in Portuguese). March 26, 2018. Retrieved September 6, 2018. ^ "AURORA On The Themes Of "Queendom Come", Performance Anxiety And Teasing Her Upcoming Album". BUILD LDN. Retrieved September 6, 2018. ^ "Coachella 2018: AURORA Talks "Queendom" & Her Sophomore LP". Idolator. April 17, 2018. Retrieved September 6, 2018. ^ "Enter norwegian dreamer aurora's queendom in her intimate new music video". i-d (Vice). May 2, 2018. Retrieved September 6, 2018. ^ "AURORA tells us about her surprise 'empowering' new album 'Infections Of A Different Kind – Step 1'". NME. September 28, 2018. Retrieved October 2, 2018. ^ "An Interview with Aurora". Live in Limbo. September 28, 2018. Retrieved July 4, 2018. ^ Christopoulou, Danai (August 28, 2018). "What You Should Know About Norwegian Pop Singer Aurora". The Culture Trip. Retrieved October 2, 2018. ^ Ryan, Gavin (2 April 2016). "ARIA Albums: Zayn Has the No 1 Album in Australia". Noise11. Retrieved 2 April 2016. ^ a b "Discographie Aurora Aksnes". German Charts Portal. ^ a b "AURORA". Officialcharts.com. Official Charts Company. ^ a b "AURORA - Chart history". Billboard. Retrieved 23 March 2016. ^ "All My Demons Greeting Me As A Friend by Aurora - Music Charts". Acharts.co. Retrieved 17 April 2018. ^ "VG-lista – Topp 40 Album uke 40, 2018". VG-lista. Retrieved 6 October 2018. ^ "Discographie Aurora Aksnes". irish-charts.com. Archived from the original on 17 November 2015. ^ "Certified Awards" (To access, enter the search parameter "Aurora" and select "Search"). British Phonographic Industry. Retrieved 24 March 2017. ^ "IFPI" (Enter "Aurora" into the "Keywords" box, then select "Search"). International Federation of the Phonographic Industry. Retrieved December 27, 2017. ^ "Aurora records video for Scarborough Fair". Gshow (in Portuguese). Retrieved 2017-10-23. ^ "Forbildepriser til kvinnene i musikklivet". News. Norsk musikkråd (online) (in Norwegian). Oslo: Norwegian Music Council. 8 April 2014. Archived from the original on 14 July 2014. Retrieved 27 April 2017. Wikimedia Commons has media related to Aurora Aksnes.